In these days of high unemployment, job seekers need every advantage when they are looking for work. 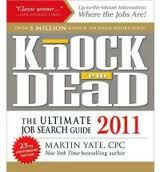 The book Knock 'em Dead 2011: The Ultimate Job Search Guide provides a complete overview of job-search strategies to help you stand out from the crowd. The book is divided into five sections, each of which covers a different aspect of the process of finding a job. Part one, "The Well Stocked Briefcase" includes advice, exercises and examples of what needs to be on a modern, technologically-savvy resume. I especially like advice such as how to create your own "professional brand" and how to "get inside an employer's head." The second section of the book deals with job interviews -- how to land them and how to project your most professional image during the interview. Part three is invaluable as it deals with how to handle yourself during the interview, including the types of questions to expect (and what sort of answers will best impress the interviewer), the different types of interviewers (some know even less than you do about the job you're applying for!) and how to cope with unorthodox interview locations. After you've survived the interview, you're still not finished. Part four of the book deals with such issues as interview follow-up, dealing with job offer negotiations, fielding multiple job offers at the same time (we should be so lucky! ), and how to "ace" psychological tests that might be required before you start your new job. The final section of the book discusses thirty-five occupations which will see job growth in the near future. Each occupation is described in detail, as well as the outlook for that job and Internet sites that provide more information. I found the advice in the book to be very encouraging and applicable. I know that it can be difficult to know where to start when trying to find a job. I especially liked the "Knock 'em Dead" tips sprinkled throughout each chapter. With this book, everyone will find plenty of advice and concrete examples that you can apply to turn your job search into a job offer!